The Tazewell County Courthouse in downtown Pekin celebrated its 100th birthday just last month. Serving the county for as long as it has, the courthouse is neither the first such structure in Tazewell County history nor the first courthouse to be built at that location. As told in Charles C. Chapman’s 1879 “History of Tazewell County,” the first Tazewell County Courthouse was located in Mackinaw, which was originally the county seat, being located in the county’s center. 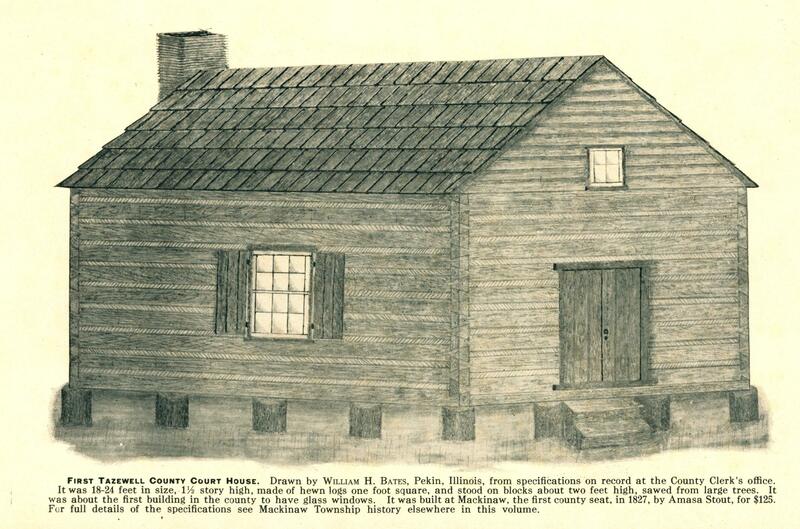 The first courthouse, a log house 24 feet long and 18 feet wide, was built at a cost of $125 in the summer of 1827 on lot 1 of block 11. Improvements were made to the simple structure in 1830, but in the summer of 1831 the court relocated to the old Doolittle School at the corner of Elizabeth and Second streets in Pekin. Pekin historian William H. Bates drew this representation of the first Tazewell County Courthouse, located in Mackinaw, for the “Historical Souvenir” that Bates published for the dedication of the new courthouse in 1916. The court was relocated to Pekin because in Dec. 1830 the Illinois General Assembly had created McLean County out of the eastern portion of Tazewell County, which originally was much larger than it is today. With the redrawing of the border, Mackinaw was now toward the eastern edge of the county, and many county officials thought the new town of Pekin would make a better county seat than Mackinaw. For the next few years, Pekin would function as the de facto county seat even though it had not been established as such by law. But in 1835 the state legislature appointed a commission to permanently fix Tazewell County’s seat, and the commission opted for Tremont rather than Pekin, because Tremont was close to the center of the county. The court moved to Tremont on June 6, 1836, and a temporary courthouse was promptly erected there at the cost of $1,150. 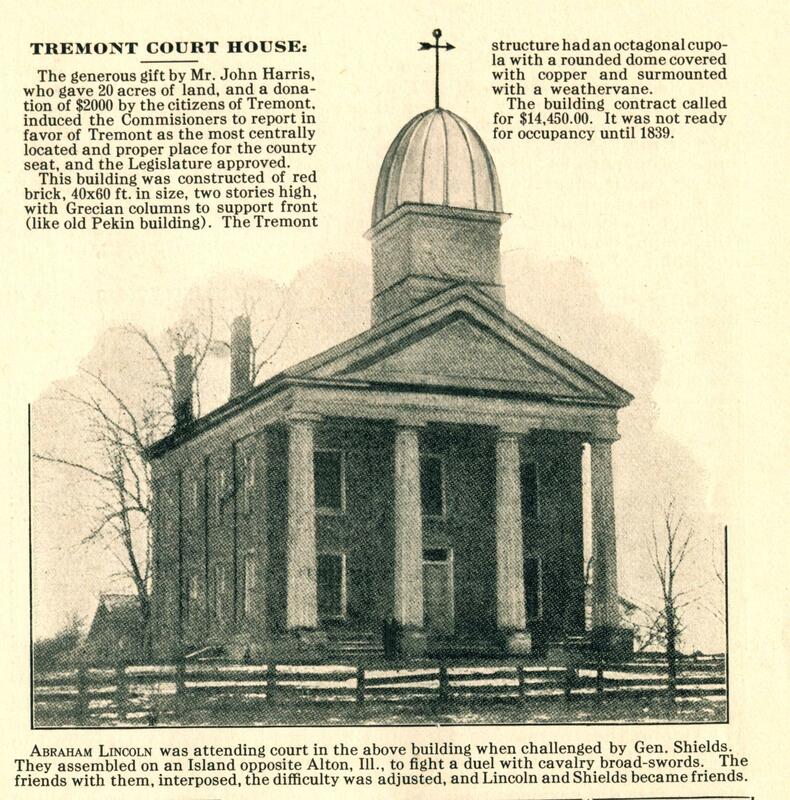 Then in 1837 construction began on a permanent brick courthouse in Tremont for $14,450. That structure was completed in 1839 – the same year that the residents of Pekin formally began efforts to have the county seat transferred back to their town. William H. Bates reproduced this photograph of the old Tazewell County Courthouse in Tremont for the 1916 “Historical Souvenir” that he published for the dedication of the new courthouse. The conflict ended in 1849, when the citizens of Tazewell County voted to move the county seat to Pekin, where it has remained ever since. A new courthouse was then built in Pekin in 1850, at the site of the present courthouse. “The question [of the county seat’s location] having been finally and definitely decided the courthouse was immediately erected by the citizens of Pekin, in fulfillment of their promise. The last meeting of the Board of Supervisors . . . that was held at Tremont was Aug. 26, 1850, when it moved in a body to their new and more commodious quarters, and on the same day dedicated the edifice by holding therein their first meeting in Pekin,” Chapman writes. The old Tremont courthouse remained in use as a high school for several years, later being used as a community center and dance hall, until at last the ground level was used as tenements before the dilapidated structure was razed around 1895. The old county histories note that Abraham Lincoln practiced law in both the Tremont courthouse and the 1850 courthouse in Pekin. “Pekin: A Pictorial History” notes that for the construction of the Pekin courthouse, “Gideon Rupert (his residence is the current homesite of the Noel-Henderson Funeral Home) contributed $600 and with others’ generosity, raised the needed funds for the building. The cost was $8,000. Local products of sandstone, quarried five miles northeast of Pekin, and bricks, fired at the Jansen and Zoeller Brickyard on the East Bluff, were used.” The building also had white marble columns. 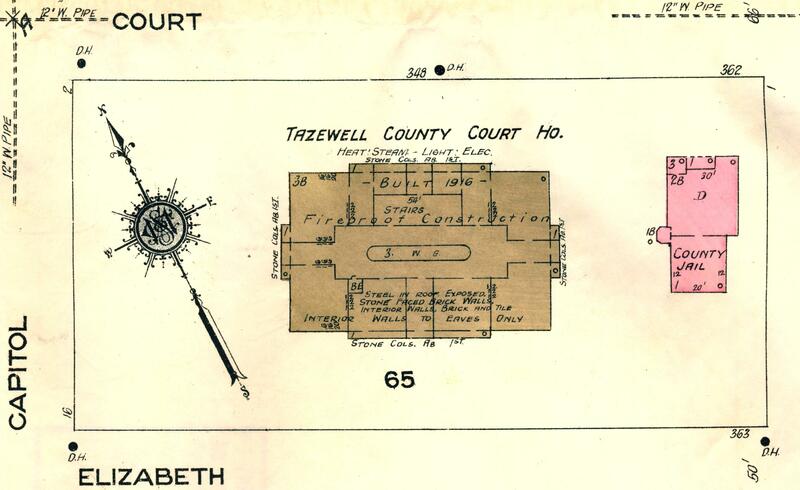 The layout of the Tazewell County Courthouse Block in November 1903 is shown in this detail from a Sanborn fire insurance map of downtown Pekin. In addition to the courthouse, the block also encompassed a band stand, the county jail and Sheriff’s dwelling, and the county offices building. The courthouse, band stand, and offices building were demolished in 1914 to make way for a larger, even more grand courthouse. Also helping to defray construction costs were prominent local landowners David and Elijah Mark, who each gave $500. The heirs of the Mark estate would eventually donate the land that would become James Field in Pekin. The 1850 courthouse remained in use until 1914, when it was razed to make way for a new and larger edifice – the current structure, which was built over the next two years at a cost of $212,964. 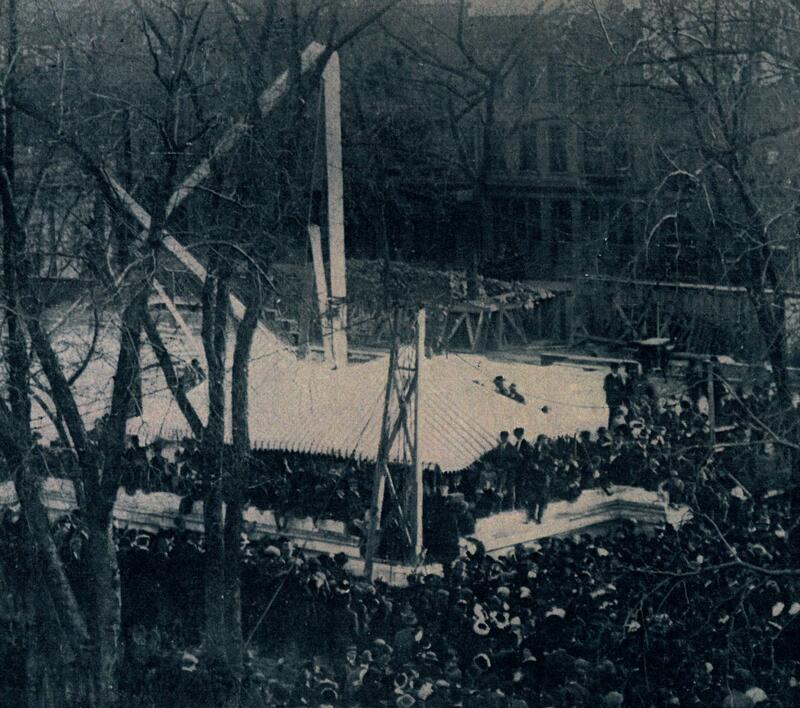 his vintage photograph shows the laying of the new Tazewell County Courthouse’s cornerstone in 1914. Standing next to scaffolding in the foreground is William H. Bates displaying the time capsule to the crowd before it was sealed in the cornerstone. 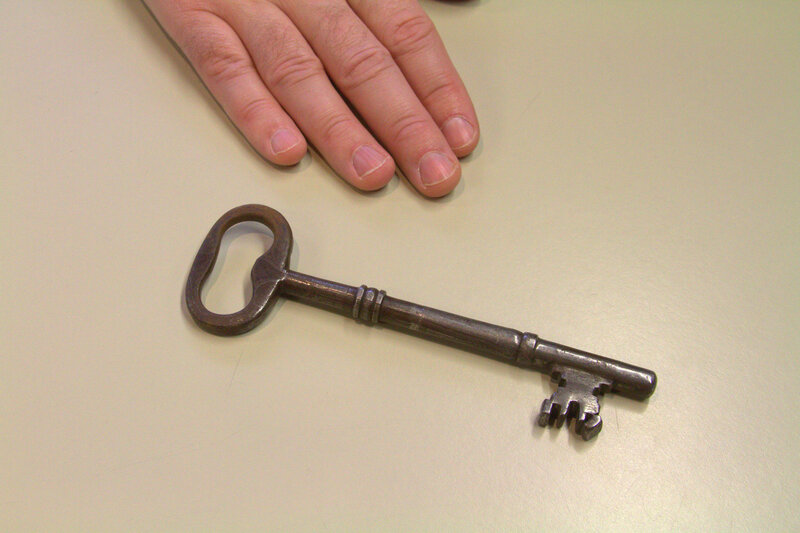 Shown is a key to the old 1850 Tazewell County Courthouse that was preserved in the 1902 Pekin Library Cornerstone time capsule. Another key to the old courthouse was included in the 1914 courthouse cornerstone time capsule. Though the old 1850 courthouse is long gone, some of the marble was claimed by Pekin’s pioneer photographer Henry Hobart Cole for use in the home he built in Tuscarora Heights in Peoria County. Other surviving mementos of the 1850 structure are two courthouse keys. One was placed in a cornerstone time capsule at the construction the old Pekin Public Library in 1902. That time capsule was opened when the old library was razed in 1972, and that courthouse key and the other contents of the cornerstone, which were found to be in a very good state of preservation, are kept in the library’s historical archives. Another courthouse key was found in the recently opened 1916 courthouse time capsule. 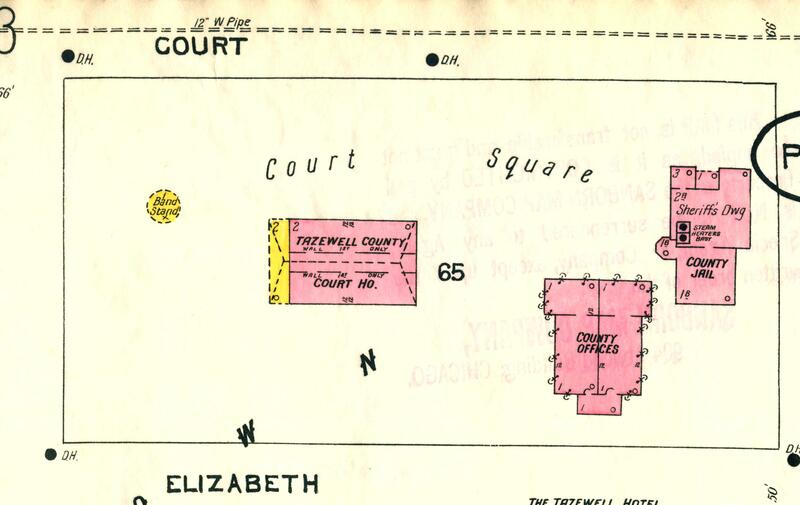 The layout of the Tazewell County Courthouse Block in September 1925 is shown in this detail of a Sanborn fire insurance map of downtown Pekin. The courthouse’s cornerstone was laid in 1914.